The move would have international implications and raise fears of rights abuses. Supporters of Erdogan hold an effigy of U.S.-based cleric Fethullah Gulen hanged by a noose during a pro-government demonstration on Taksim Square in Istanbul on July 18. A damaged window is pictured at the police headquarters in Ankara, Turkey, on July 18. Turkey’s government has responded to Friday’s failed military coup with vows of harsh retribution as it continues a purge of its suspected opponents this week. Amid tens of thousands of arrests and mass firings, President Recep Tayyip Erdogan has also signaled that he may attempt to reinstate the death penalty in Turkey. Erdogan stated Sunday there should be “no delay” in bringing back the penalty, as supporters chanted for its reintroduction during demonstrations following the attempted coup. The president will now leave parliament to decide whether to introduce a motion to reinstate the punishment, he told broadcaster CNN Turk on Monday. The prospect of capital punishment returning to Turkey, which officially abolished the practice in 2004, has both serious political and human rights implications. If parliament does change the law, it would be another blow to global abolition of the death penalty after a year that saw its highest worldwide use in over two decades. A reintroduction would also pose a major problem to any accession talks between Turkey and the European Union. The EU strictly forbids any of its members the use of capital punishment, which was the impetus for Turkey banning the practice as it sought talks to join the union 12 years ago. Supporters of Turkish President Recep Tayyip Erdogan wave Turkish national flags during a pro-government demonstration on Taksim Square in Istanbul on July 19. EU leaders have warned Erdogan this week that reintroducing the death penalty was unacceptable if it wanted to join the 28-nation trade bloc. In a phone call on Monday, German Chancellor Angela Merkel told Erdogan that such a move would be incompatible with EU membership, while Merkel’s spokesman Steffen Seibert told media that reinstatement would mean the end of negotiations. Prior to the attempted coup, which left at least 232 people dead and over 1,000 wounded, Turkey had been pushing for revitalized negotiations on joining the EU. A deal between the union and Turkey on the movement of refugees in March included an agreement that the bloc would “re-energize” talks toward accession no later than this month, but the prospects for those talks are now in serious question. In addition to condemnation from European leaders, advocacy groups have also voiced worries that Turkey’s human rights situation could be heading for a rapid deterioration. 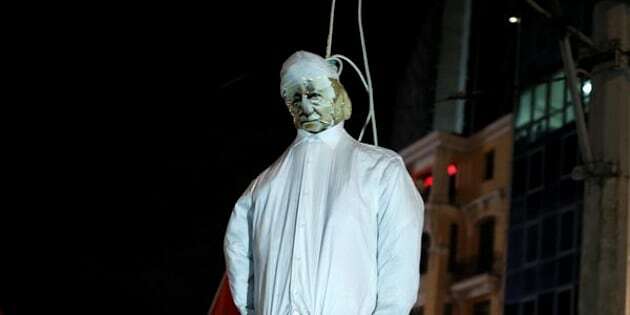 “Statements by the President and government officials that the death penalty could be brought in retrospectively as a punishment for those found to be responsible for the coup attempt are a significant concern, as this would violate human rights conventions to which Turkey is a party, and protections within Turkey’s constitution,” Amnesty International said in a press release provided to The WorldPost on Monday. As EU politicians and rights groups lobby Erdogan to reconsider his push for reinstating the death penalty, many in Turkey have called for those behind the bloody coup attempt to be executed. In addition to pro-government rallies, the hashtag #Idamistiyorum, which translates to “I want the death sentence,” was trending on Twitter in Turkey over the weekend. It’s unclear at this point exactly who or how many of the alleged coup plotters Turkey would seek the death penalty for, if the laws were amended. Over 7,500 soldiers have been detained since the failed coup, while Turkey charged 27 senior officers with treason and accused former air force commander Gen. Akin Ozturk of heading the plot. State media initially said Ozturk confessed, but he later denied planning or leading the coup to prosecutors. Rights advocates have urged Turkey to reconsider its reaction to the coup, fearing that the crackdown will lead to abuses. “The coup attempt unleashed appalling violence and those responsible for unlawful killings and other human rights abuses must be brought to justice, but cracking down on dissent and threatening to bring back the death penalty are not justice,” John Dalhuisen, Amnesty International’s director for Europe and Central Asia, said in Monday’s press release. Turkish President Recep Tayyip Erdogan delivers a speech to his supporters in Istanbul on July 16. The global use of the death penalty drastically increased last year, with the number of people executed being the highest recorded by Amnesty since 1989. Much of the rise in executions stemmed from just a few countries, as Saudi Arabia, Pakistan and Iran accounted for 89 percent of the recorded executions, according to Amnesty’s figures. Due to lack of verifiable information, however, their tally excludes exact numbers for China and doesn’t include North Korea. Should the government seek the death penalty for the alleged coup plotters, the country could see its first state execution in over three decades. While Turkey banned the death penalty in 2004, it hasn’t officially executed a prisoner since 1984.